Trick to become crorepati with just a habit of Rs. 35. No guys, it’s not a joke! Your dream of becoming a crorepati is no more a dream. It’s just a matter of Rs. 35, and you can build a splendid corpus for your future. Take a twenty rupee note, a ten rupee one, and a five rupee coin. Keep them all in front of you on a table and sit right there. All done! Now you are going to read some mantras and those Rs. 35 will magically turn into a corpus of more than a crore rupees. Wow! Well, no! It’s not that easy. If you think that something like this is possible, wake up. If anyone promises you anything like this which seems quite irrelevant, then don’t trust. Systematic Investment Plan (SIP) is one of the most famous and trending topics of discussion. You too must have heard about it. The fantastic benefits provided by it are attracting the attention of all the investors towards it. One of the most effective features of SIP investment in mutual funds is that you can even start it with a small amount of Rs. 1,000 monthly. However, most people talk about the benefits of SIP investments. But, sometimes it becomes harder to save even Rs. 1000 for investing at the end of the month, especially when you are a student or an individual working person. But, if you make even a rough account of all your monthly transactions, you will find that you have wasted more than 1,000 bucks in some unwanted spending. However, realising the same fact at the end of the month when you need one thousand bucks for investing is like crying over split milk. Rather you need to be cautious while making any useless expenditure. How? It’s simple, track your account daily instead of tracking it at the end of the month. Check it daily that if you had spent your money on purchasing any unwanted goods. From Where Did the Matter of Rs. 35 Came into the Picture? Hold on! Hold on! A small saving of Rs. 35 can help you in becoming a crorepati, and yes it’s true. Just try to save Rs. 35 daily from your pocket money, or from your daily expenses. You can also save it by ignoring your fast food cravings. It’s just a matter of Rs. 35. Sacrifice your daily burger that you eat while coming home from the office, and that’s it. You’re done. You can now become a crorepati. How to give life to the entire idea? Your daily savings of Rs. 35 will become Rs. 1050 at the end of each month, i.e., 35*30= 1050. This Rs. 1,050 will help you in starting your investment in mutual fund SIP. 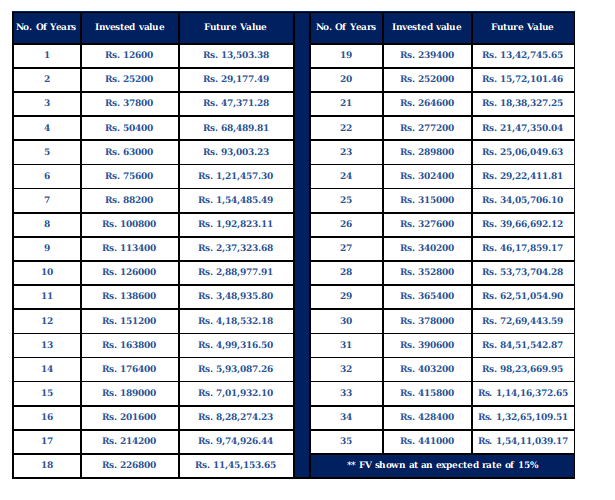 If you invest this 1050 bucks each month through SIP, then you would have invested a total of Rs. 12,600 at the end of one year. Similarly, when you keep going with this habit for a significant period of time you can create a healthy wealth. At the end of 35 years, your total invested value would be around Rs. 4.4 lakh and at an expected return rate on your investments, you would gain a corpus of around Rs. 1.5 crore. Yes, Rs 35 daily for 35 years can make you fetch around Rs. 1.5 crores. The Power of Compounding : The money that you invest in mutual fund SIP earns compounding interest on it. The compound interest is said the eighth wonder of the world by Albert Einstein. The main power of compound interest is that it earns interest on interest and enlarge your investments to become a corpus over a significant period of time. Suppose you have invested Rs. 1,00,000 for S.I. 12% for five years and another Rs. 1,00,000 for C.I. 12% for five years. At the end of five years, the value of both the investment will be Rs. 1,60,000 and Rs. 1,76,234.17 respectively. Hence, you earn more in case of compound interest. Moreover, if you keep your investment for one more year, i.e., in total six years, your money will be almost doubled in case of compound interest. Whereas, the simple interest will make it only Rs. 1,72,000 at the end of sixth year. To check more about investment-related details, get registered with us right away and experience a new way to build wealth. We, at MySIPonline, have simplified solutions to all your online mutual fund investment-related issues. Keep reading our daily blogs to enhance your knowledge of mutual fund investments and related news.